Nintendo has created several products that were ahead of their time. Virtual Boy comes to mind as a product that was probably two decades too soon. There was another extremely quirky peripheral for the NES that falls into this same category: the Power Glove. Players could finally play their games with a way worse input device. It was clunky, the tracking barely worked, and my parents made me return it when I couldn't get Rad Racer to work with the thing. Nintendo was experimenting with hand presence back in the early 1990s, but Teague Labs may have finally figured out how to play with power with their recent mod of the Power Glove. Using HTC Vive trackers, the team has come up with some really cool ways to use the failed product. 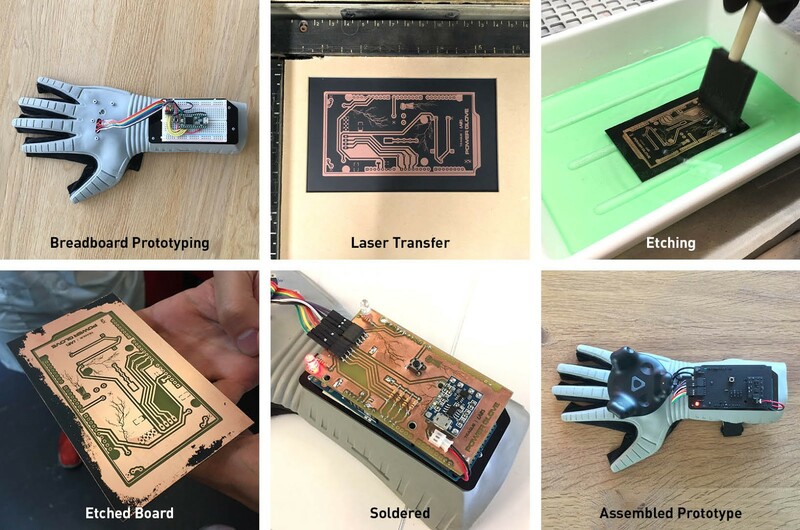 "We took a Power Glove apart, 3D scanned the interfacing plastic parts and built modified parts that hold the Vive Tracker and an Arduino Due on the glove. After some prototyping on a breadboard, we designed a shield for the Due and etched it using the laser-cutter transfer technique. We then soldered all components and spray-painted the whole shield to protect the bare copper. After mounting the tracker and tweaking the code by matzmann666, we had the glove work. If you are more curious or want to reproduce this, we uploaded all of our files on GitHub." Now they are playing with power! Cheers to Teague Labs!